The Giants' Justin Tuck says he'd rather have Eli lead his team than Peyton because Eli "has more Super Bowls." Nice sentiment from a teammate, but a silly choice. This Sunday afternoon’s matchup between the Denver Broncos and New York Giants at MetLife Stadium—or “Manning Bowl III,” as the football press is calling it—pits the brothers Peyton Manning and Eli Manning, the teams’ respective quarterbacks, against each other. The Broncos vs. the Giants aren’t on the 2014 schedule; Peyton, who will be 38 next March, may not play much longer, and preseason odds indicate that face-off in February, in the same stadium, for the Super Bowl is unlikely—so this weekend’s matchup may well be one of fans’ last chances to see the Mannings battle for superiority on the field. There are, of course, arguments for Eli: One, like Tuck said, he’s won two Super Bowls to Peyton’s one. Does that, I wonder, create some tension at the Manning household when they sit down for Thanksgiving dinner? When Peyton asks Eli to pass the collard greens, does the little brother flash his second Super Bowl ring? And two, Eli is 8-3 in postseason games while Peyton is 9-11. In fact, before Eli won his first ring in 2008, already the rap on Peyton was that he couldn’t win the big one. One writer even called him “The Picasso of Choke Artists,” and Peyton was a good enough sport to spoof his reputation when he hosted Saturday Night Live in 2007. How justified is that reputation, though? Nearly all the other statistical evidence of quarterback excellence tilts in Peyton’s favor. Over the course of their careers, their regular season stats aren’t even close. In 225 games dating back to 1998, Peyton’s teams (the Indianapolis Colts through 2010, and the Broncos since then) are 155-70 (a .689 win-loss percentage), while Eli, who has played every game since his 2004 rookie season for the Giants, has led his team to a record of 78-58 (.574). Almost any statistic you choose could prove the same point. Pass completion percentage? Peyton’s is .652, Eli’s .587. Interception percentage? 1.8 percent for Peyton, 3.3 percent for Eli. Touchdown passes? Peyton, with 443, is second on the all-time list, behind only Brett Favre, and has led the league in scoring throws three times. Eli has 215 and has never led the league’s passers in TDs. In the most important of all passing stats, yards per throw, Peyton has averaged 7.7 to Eli’s 7.1, and in overall QB rating it’s no contest—Big Bro, 96.0; Baby Bro, 82.9. 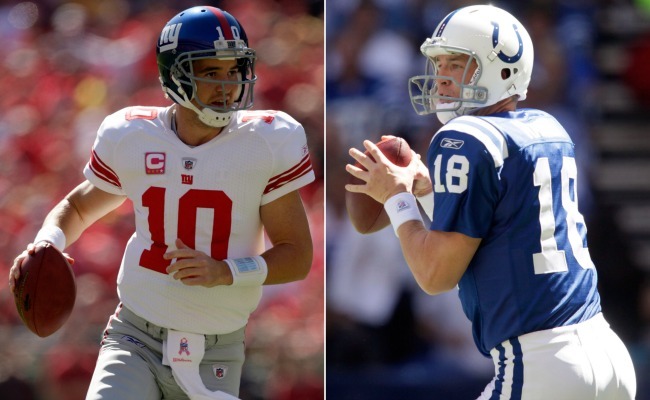 And in their two previous head-to-head meetings, Peyton has completed 45 of 67 for 531 yards while Eli has connected on 33 of 58 for 408 yards; Peyton’s team won both games 26-21 in 2006 and 38-14 in 2010. Importantly, though, there’s only so much a quarterback can do, and not all stats—arguably no stats—reflect just the quarterback’s performance. In baseball, you can say with some certainty that Miguel Cabrera or Mike Trout are superiors to other hitters by looking at their on-base and slugging averages, which are solely the products of their individual effort. But all QB numbers are impacted not just by the passer’s ability but his teammates’ performance in pass blocking, running, and even special teams and defense. The QB can do nothing to impact his team’s defense except control the ball on offense and limit the number of plays the opposing team can run. For instance, I’d argue that in the Broncos’ loss this past January to the Baltimore Ravens, Peyton did just about all a quarterback can do, putting up 35 points and passing for 290 yards and 3 TDs. One would have to give most of the credit for that passing offense to Peyton and pretty much let him off the hook for the fact that the Ravens, who went on the win the Super Bowl, won the game by scoring 38 points. Many of the postseason failures of Peyton’s teams can be attributed to bad defense. Compare him to three-time Super Bowl winner Tom Brady. Brady’s teams are 17-7 in postseason play. His pass completion percentage is .623 to Manning’s .63. In four more games, Brady has thrown for 270 more yards, 5949 to 5579. Brady has 42 TD passes against 22 interceptions to Peyton’s 32-2 and has a slightly lower passer rating—87.4 to Manning’s 88.4. In yards/throw, Peyton has a big edge over Brady, 7.46 to 6.71. One might look at those numbers, I suppose, and still conclude that Brady has been a better postseason passer is only because his teams won more games. But I don’t see how you can look at Peyton Manning’s numbers and conclude that he’s a choker. Let’s compare Peyton’s postseason record to Eli’s. Since Eli has played in nine fewer playoff games, let’s use stats that reflect quality rather than quantity: Peyton has a .632 pass completion to Eli’s .615; Peyton’s QB rating is 88.4 to Eli’s 89.3. And Peyton’s yards per throw is 7.4 to Eli’s 7.07. Clearly these numbers mark Eli as an outstanding postseason passer, but how can one argue that Peyton has done any less to help his team win? Both brothers have played in two Super Bowls. In them, Peyton completed .675 percent of his passes, threw for 600 yards and had two TDs and 2 interceptions. Eli completed .622 percent of his passes and threw for 551 yards with three TDs and one interception. To borrow a term from basketball, I’d say that’s a jump ball. Peyton [while with the Colts] played half of his games in a weather-controlled dome, and Eli battled through frigid temperatures in the wind tunnel that was Giants Stadium. Therefore, achieving a statistical advantage over Eli should come as no surprise. That logic, I think, is faulty. Brett Favre has more TD passes than any QB in league history, and in Green Bay he played in worse conditions than Eli Manning has ever had. Tom Brady’s career numbers are superior to Eli’s, and I don’t think anyone would argue that weather conditions in Foxborough, Mass., are more pleasant than those in New Jersey. Peyton, who in Week One of this season tied a league record with 7 TD passes against the defending Super Bowl champion Ravens, is on a roll. He’s already earned the title of greatest regular-season quarterback ever, and only a little bad luck has kept him from assuming the unofficial title of Greatest Quarterback Ever. If he demolishes the Giants’ defense on Sunday afternoon, he’ll take a huge step toward his second Super Bowl ring, and if that happens, I predict few people will remember he was ever called “choker.” The long-unfinished Manning vs. Manning business will be a step closer to finished, and the entire Manning family can have Thanksgiving dinner in peace.